Users looking for Lenovo IdeaPad laptops with 4K screens, some of the earliest laptops of their kind, are going to have to wait longer because they just shipped—but without 4K displays. Initial IdeaPad Y50 (15.6-inch screen) and Y40 (14-inch screen) gaming laptops started shipping this month with high-definition 1920x1080-pixel screens. The 4K display option for the Y50 will be added in July, a Lenovo spokeswoman said in an email. A specific shipping date for the Y40 4K display was not immediately available. The 4K displays will show images at four times the resolution of 3840x2160 pixels, making the laptops good for high-end gaming and multimedia. The laptops were demonstrated in January at the International CES. TVs, monitors and cameras are already available with 4K, but other laptops with displays at that resolution are just being introduced. Toshiba in late April started shipping the $1,499 Satellite P55t with a 4K monitor, but it is now listed as not being available on Toshiba’s online store. Instead, the company is now shipping the more expensive 4K Satellite P50T-BST2N01 laptop, which starts at $1,799. Display issues have plagued Lenovo in the past. In 2011, ghosting issues—in which images temporarily remained fixed on screens—affected ThinkPad X220 laptops. Lenovo had also delayed touchscreen options for some of its laptops, including the ThinkPad X240. Lenovo was due to ship two 4K monitors—the ThinkVision 28 and the $799 ThinkVision Pro2840m—in April, but the products are not yet available. The ThinkVision 28 can also serve as an Android all-in-one desktop and has Nvidia’s Tegra processor. The IdeaPad Y50 starts at $1,149.99, while the Y40 starts at $1,099. The 4K displays could raise the price of the laptops by a significant amount. Laptop screens have largely topped out at 3200 x 1800 pixels, such as in Samsung’s Ativ Book 9 Plus, Lenovo’s Yoga 2 Pro and Razer’s Blade gaming laptop. The IdeaPad Y50 has Intel’s Core i7-4700HQ processor with a clock speed of 2.4GHz, and Nvidia’s GeForce GTX 860M graphics card. Other features include a 1TB hard drive, 8GB of RAM, 802.11ac Wi-Fi, two USB 3.0 ports and an HDMI slot. The more expensive models have touchscreens and more graphics memory. The IdeaPad Y40 has an Intel Core i7-4500U processor running at 1.8GHz and an Advanced Micro Devices Radeon R9 M270 graphics card. 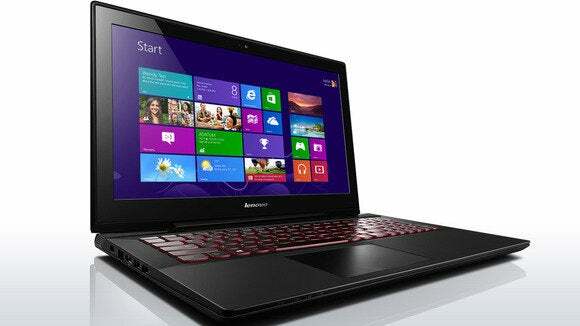 The laptop’s features are similar to the Y50, but more solid-state drive storage options are offered. Microsoft Windows 8.1 ships standard with the Y50 and Y40 laptops.